A few years back I set myself a goal to become a Google Certified Teacher. I know we talk to our students a great deal about goal setting but often I wonder about how seriously we, as teachers, take the concept when it comes to our own learning. In my experience, the process of goal setting has been more of a school-enforced procedure. Over the years I have had many a “professional learning plan” neatly complied and then duly tucked away in a drawer for review at a later stage (in honesty, sometimes the “later stage” never arrives!”). If this is the case then there is a value, system and process problem along the chain. Fortunately, our school are operating on a more robust and realistic level these days, thanks in part to my colleague @RachelGeorge38 Our language and actions are now directly related to smart goals, regular ‘checking in’ conversations and a genuine approach to pursuing goals that enhance learning for the STUDENTS and not just the teachers. Meaningless, lacks specificity, deadline-less, no way of measuring etc etc. What aspects of education excite you? What would you like to be an expert on? On which things can you offer value and expertise for your colleagues? What makes you / will make you stand out from the crowd of average teachers? For me, the idea of radical change in education is something I’ve become increasingly interested in as my experience grows. A more contemporary, forward thinking, innovative organisation you would struggle to find. I’ve often wondered what it may be like if Google opened schools of their own. As a result, attending Google Teacher Academy became a dream that I was determined to pursue and realise. So when the opportunity arose to apply in region for Sydney 2014 I felt the time was right. 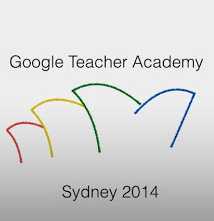 You have been selected to participate in the Google Teacher Academy in Sydney. After reviewing your application, we believe that you have the commitment and passion to grapple with some of the biggest education challenges we face! The team is excited to have you join us in September 2014 at the Google office in Sydney, Australia. Without giving too much away, the process of application was both demanding and fun. Here’s a sneak peak. Question 1. Provide your 6-word memoir. One of the most well known, and most public, parts of the application process is the one-minute video. There’s always an element of mystery and surprise over the content of GTA’s around the world, which is cool. But overwhelmingly there is a strong purpose to make sustainable change in a positive way within your school community. There is also a responsibility to continue to give back to the community after your accreditation, be it as a mentor to other GCT teachers, as a leader of GAFE summits, or simply as an ambassador for change within in your own school. This is not your everyday turn-up-and-fall-asleep PD session. With No Tosh as part of the learning and mentoring team, I am excited to learn more about design thinking and to meet a whole new network of educators who think in ways that very few do. To sign off, I wanted to provide a taster of the theme of #GTASyd 2014. To be couragous enough to think about things in different ways changes the world and makes impossible things possible. Hold on Google, here comes Ross!